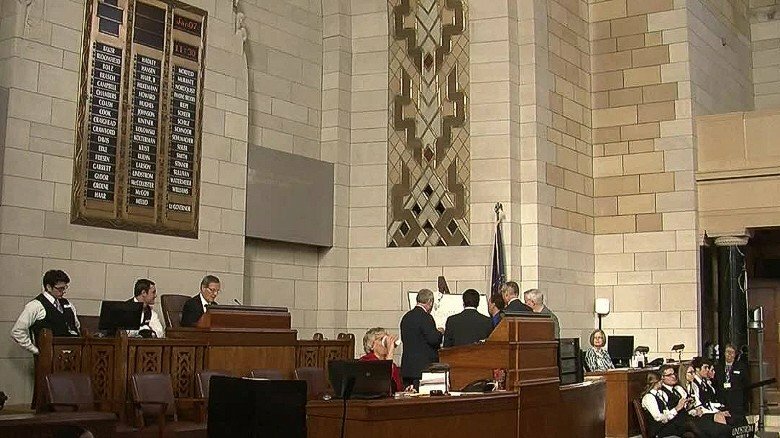 Nebraska became first conservative state in more than 40 years to abolish the death penalty after a veto-override was passed through its Legislature. The lawmakers defied their Republican governor, Pete Ricketts, a staunch supporter of capital punishment who had lobbied vigorously against banning it. The measure was backed by a coalition of conservatives who oppose execution as a form of punishment. Nebraska joins 18 other states and the federal district of Washington, DC, in banning capital punishment, and is the first traditionally conservative state in four decades to do so. The state has not executed an inmate since a 1997 electrocution. Some of the lawmakers said that they support the death penalty in principle, but said that legal obstacles meant the state would be unable to carry out executions in the future. A Nebraska State Patrol spokeswoman said her agency was investigating death threats made against a state senator who supported the measure. Ten men are on currently Nebraska’s death row. The state has never executed a prisoner using lethal injection – the current method for carrying out the death penalty in the state. The state lost its ability to carry out an execution in December 2013, when one of the three lethal injection drugs used in the procedure expired. The most recent state to eliminate the death penalty is Maryland, which ended capital punishment in 2013.